Tough, dependable and proven, parabolic troughs have singlehandedly drawn a line of indisputable respectability under the entire CSP industry. Solar power towers produce higher temperatures, solar dishes offer higher efficiency and Fresnel reflectors enjoy lower manufacturing costs. So will one of these prove more important in the long-run than the technology that took an early lead in the CSP race – namely the Parabolic Trough? It could take until 2020 to find out. But until then a powerful incoming tide will be lifting all ships in the concentrating solar power industry, with parabolic troughs indisputably in the lead. Tough, dependable and proven, parabolic troughs have singlehandedly drawn a line of indisputable respectability under the entire CSP industry. Critics can no longer dismiss it as untested, too dirty, or simply not yet ready for market. With that huge issue settled, the next big question is: how cheap can it get in the next 10 years? But before getting into that, some history might help. Parabolic troughs’ current respectability comes thanks to a cluster of 354 MW of parabolic trough capacity in the California desert. In response to the 1970s oil-crises, the USA showered tax and investment incentives on alternative energy. In response, Israeli startup Luz Energy Partners built a series of parabolic trough plants in the southeastern California desert, aided by tax credits totalling nearly 40% of its costs. The result was an expansion of capacity in California, and a fall in the cost of parabolic trough-generated electricity of 50% between 1985 and 1989 (from US$0.30/kWh to US$0.14/kWh, a 14% drop each year). The reductions came from research and development, economies of scale and accumulated experience. An additional benefit came from the intrinsic simplicity of CSP. In general terms, CSP is really no different than starting a campfire with a magnifying glass. The only difference is CSP uses reflective mirrors to direct and concentrate sunlight instead of light-focusing glass. With CSP, there's no complicated silicon manufacturing processes (as with solar PV), no deep holes to drill (as with geothermal) and no high-altitude turbine housings to keep greased (as with wind). CSP plants are little more than collections of highly-polished bathroom mirrors laid close to the ground that generate simple, high-temperature heat that drives steam turbines traditionally powered by fossil fuels. The bad news, of course, was that like all new technologies, CSP needed help finding its legs. In the late 1980s, these got pulled from under it. That's because by 1989, oil prices had fallen, politicians lost interest in renewables and petrol-guzzling cars and electricity-guzzling air conditioners became consumer items of choice. In response, politicians cut the 40% renewable energy tax credits, down to as low as 10%. They further hobbled those with short-sunset clauses. As a result, Luz executives had to spend more time in Washington lobbying to renew expiring tax credits than they did running their business. This proved fatal and Luz went under in 1991. Its California assets were eventually sold to Florida-based electric utility Florida Power & Light (FPL). FPL has kept the plants running since then but hasn’t expanded them. To date, the California parabolic trough plants have generated well over 12,000 GWhs of utility-scale solar electricity for the California grid. To date, more than half of all solar electricity ever generated has come from these California plants. That's some pedigree. Now, with alternative energy back in vogue following the Rip Van Winkle 1990s, these California solar workhorses are enjoying a renaissance. With a 20-year operating record behind them, Parabolic troughs’ technology and economics are unassailable. And to this happy background can now be added more good news: smarter, longer-lasting Government incentives. In Germany and Spain, premium solar energy wholesale prices through feed-in tariffs are guaranteed for decades. These provide certainty to developers and bankers. Over in the USA, meanwhile, the sunny western state of Nevada has mandated that 20% of its electricity consumption needs to come from renewable energy by 2015. And many other States besides Nevada have set in place similar Renewable Portfolio Standards of their own. These developments have defibrillated the industry. In Nevada, the first large-scale concentrating solar power project built anywhere in 15 years is online and generating electricity. In so doing, the 64MW Nevada Solar One is showing that the lightning in the bottle represented by the 1980s Luz plants was no one-off fluke, and that the technology is replicable. In sunny southern Andalucia in Spain, meanwhile, the 50MW parabolic trough Andasol 1 project is nearing completion, to be followed by equal-sized Andasol 2 and Andasol 3. And then there's the announcement, hot off the press, that Abengoa Solar plans to build the Solana Generating Station near Gila Bend, Arizona. The plant will be generating power by 2011. Globally, the southwestern USA, the north Africa/southern Spain region, and the Outback in Australia are the regions where direct normal radiation is strongest and thus most suited to CSP. Unfortunately, Australia to date has lagged far behind the US and EU in encouraging utility-scale solar thermal concentrating solar power. Even so, private companies like Acquasol are lining up to build parabolic trough solar thermal capacity there, because the nation has such strong solar resources, and big electricity needs. Meanwhile, the US federal Government still appears wedded to toying with inefficient, short-leash tax subsidies such as limited duration investment tax credits. These tend to create boom/bust cycles and short-term gold rush mentalities in infant industries. Happily, more sensible incentives are coming out of individual US States, although the gold standard of renewable energy inducements remains – hands down – certain European countries’ guaranteed, multi-decade premium feed-in tariffs for solar electricity and other renewables such as wind. Taken together, this bundle of global incentives is now creating a new wave of investment in CSP, particularly low-risk parabolic troughs as shown by Nevada Solar One and the Andasol projects. As more parabolic trough projects get built, US and European researchers believe a kWh of parabolic trough electricity could fall from US$0.11/kWh or so today to US$0.4/kWh by 2020. The bulk of these price falls will come from R&D, economies of scale in manufacturing, and from building larger plants. Similar cost reduction dynamics are expected in solar towers, dishes and fresnel reflectors. Parabolic trough concentrating solar power creates heat of up to 400 degrees C. Thermal storage allows this heat to be kept in an insulated container, so that the energy can be used later, for instance to double up power production during afternoon grid peak demand periods, or into the evening. At present, molten salt is the medium of choice for thermal storage, but this could change. The early, experimental California CSP plants had heat storage, so does Nevada Solar One and so will the Andasol plants. As experience grows here, look for innovation. As this occurs, the operational flexibility of parabolic trough concentrating solar power plants for the utilities will be broadened immeasurably, and this will have large potential long-term positive impact on the economics. Better manufacturing efficiencies and the economies of scale inherent in ramping up production. CSP plants are best located in isolated desert regions where few people live. This power needs to get to the cities. Therefore, the willingness of Governments and/or private investment capital to fund construction of high capacity power lines to remote regions to service CSP plants will be crucial to the industry's long-term development. The good news here is that southern California is actively exploring such projects (Sunrise Power Link), and in Europe proposals have been made to build high capacity power lines from North Africa to Europe. In Australia, there are enticing signs that geothermal and concentrating solar power projects could co-locate in the same regions, making the economics of building power lines more attractive. One example is desalination. 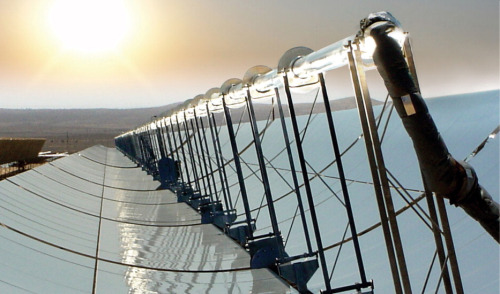 Concentrating solar power generates heat, a lot of it. This heat can be used as a direct energy input to thermal desalination. Or the heat can be turned into electricity to power reverse osmosis, an incredibly energy-intensive process that involves pumping seawater or brackish water at high pressure through a membrane. Combining CSP and thermal and reverse osmosis in one place offers huge opportunities for real cost-saving synergies, which can create large-scale, environmentally-friendly power and water solutions. Other technology bundles will no doubt present themselves as time goes on. CSP is highly flexible. At present, it looks as if the concentrating solar power technology and cost-reduction race appears parabolic troughs to lose. But thinking that way misses the point. The looming global replacement cycle of ageing fossil fuel electricity generation capacity is so huge that, coupled with rising per capita energy use and the massively expanding electricity needs of India and China, huge amounts of electricity generation capacity are going to be needed in the coming decades. Given this, the half-penny per kWh that may ultimately separate parabolic troughs from dishes, towers and fresnel reflectors may ultimately pale into comparison with the dramatically lower cost that the technology enjoys over the long term, against any properly carbon-adjusted costs of future coal, nuclear and natural gas capacity. In the coming battle for global electricity generation investment – based on low prices, greenhouse gas friendliness and proven technology – the global game certainly seems like it's concentrating solar power's to lose. And within the concentrating solar power industry, it certainly seems like the coming battle is parabolic troughs to lose.